Roadman dies, cop pulled from river through hole in bridge during flood in Nutley, N.J. So spoke a happy Nutley police officer named John Guerino from Room 254 at Clara Maass Memorial Hospital. He's in good shape and good spirits following a dramatic rescue here Monday that won't be forgotten for a lifetime. 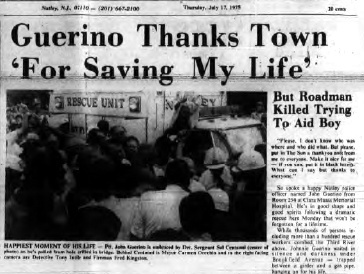 While thousands of persons including more than a hundred rescue workers combed the Third River above, Johnnie Guerino waited in silence and darkness under Brookfield Avenue – trapped between a girder and a gas pipe, hanging on for his life. "But I knew I had three choices. I could get out of there if the water went down. I could get out of there if someone came and got me. And I would have gotten out of there if the water got higher. But for the moment, (which turned out to be about three hours. I decided to stay where I was. At least, I knew I wat safe there." He managed to find a spot where the current was somewhat slowed down by a protruding girder and Guerino had actually lifted himself out of the water and was lying in a horizontal position." "I didn't know where I was. Exactly, I knew I was under the bridge but I didn't know how far or in what direction was the shortest way out." At one point, he grabbed a six-foot stick and tied his handkerchief on the end and tried to float it downstream hoping to signal someone of his presence. “But finally I had to let go. I guess it didn't reach to the end of the bridge anyway." Guerino later tied himself with his belt to the pipe. He thought of sending down his shirt as a signal, "but it was cold down there and I figured I'd be a lot better off with my shirt on." As the hours went by, he got hold of another slick — "my trusty friend" — and began tapping on the bottom of the road surface. No one knows how long he was tapping but eventually, John D'Emilio of 42 Hillside Avenue felt the sounds of Guerino's signal. "I was standing on the bridge and all of a sudden I fell those laps on my feet. I didn’t believe what I felt,” D’Emilio said at the time. Police Captain Donald Casciano was nearby and D’Emilio asked that a car motor be turned off so they could hear better. It was then confirmed by a series of systematic taps that Guerino was under the bridge. What was Guerino’s reaction when he first heard someone tapping back to him from above? “It sounded real good to me, believe me,” the trapped patrolman said. But the day took its toll. One man dead, another almost drowned and many others risked lives trying to locate their friends and colleagues. Louis Bolcato of 18 Moore Place, who worked with the Road Department 15 years, was found in the riverbank unconscious. He was dead on arrival at Clara Maass Memorial Hospital. His colleague, Frank Reiss, 31, who has worked with the Road Department since 1963, was pulled from the river by Fireman Fred Kingston. Reiss was not breathing but responded to mouth-to-mouth respiration and was revived. He is in good condition today at Clara Maass Hospital. The events began to unfold early Monday afternoon when one nine-year-old boy (not two as earlier believed) was fishing along the river. He somehow fell into the stream and caught onto a tree, just upstream from the Brookfield Avenue bridge. The two Road Department workmen, Bolcato and Reiss, were in the area putting up barricades to block traffic from the flooded streets. Reiss made an effort to get the young boy and apparently stepped into the river channel and was swept under the bridge. There are conflicting reports of what next happened. One report has Bolcato being swept into the river in his attempt to rescue Reiss. The second version has Bolcato running around over the bridge and downstream, tripping into a hole and suffering a heart attack. Meanwhile, downstream, Patrolmen Malanga and Guerino were attempting to reach for the boy when downstream came a man’s body. Malanga tells The Sun he thinks it was Bolcato. “I grabbed hold of the man in the water and the force took me and Guerino, who was trying to hold me back, into the river,” Malanga says. They all were then swept under the bridge. Within minutes, hundreds of rescue workers from Nutley were in all areas of the park. Volunteer firemen were summoned. Off duty firemen and policemen joined members of the Emergency and Rescue Squad and many civilian men and women assisted in the effort. Before the activities were ended, units from Hoffman-LaRoche, Belleville, Newark, Clifton, Essex County and Lyndhurst had joined the rescue operation. Until the tapping sounds were heard from the bridge, Guerino was all but given up as lost. He had been in the water nearly 90 minutes when it became apparent that the rescue operation seemingly failed. “All we can do now is wait for the body to pop up,” on veteran police official said. A priest accompanied Mayor Carmen Orechio and Chief Buel who drove to Mrs. Guerino’s home to report her husband missing. People were weeping on the riverbanks. And then came the news that taps on the bridge were being answered with taps from below. Divers from Belleville and the Essex County Park Police attempted to get under the bridge but failed. Then, Fireman Fred Kingston of Nutley, who earlier rescued and revived Reiss, grabbed an air tank and prepared to go under the bridge himself. “Who are you? Are you an experienced diver,” an officer with the Parks Police asked. Kingston said yes (he’s been down 3 or 4 times) and took the tank and worked himself under the bridge. “I knew Johnny. I was more involved.” Kingston later told The Sun when asked how he was able to get under the bridge when others could not. In any event, Kingston didn’t find Guerino, but he learned of an air pocked which was all the information workmen on top of the bridge needed to begin drilling operations. Many were fearful a drilled hole would permit the air pocket to escape and drown Guerino. Mayor Orechio reportedly was asked to make that final decision. He told the men to drill the test boring. “Yes – I’m okay but I could use a raincoat down here,” came the reply. Hundreds of people on and around the bridge cheered and cried. The rescue operation continued quickly. A bigger hole in the bridge was cut and Guerino was finally pulled from the river – three hours after the ordeal began. THE SUN: Where were the kids they who were trapped on a tree? I never saw the boy. Teddy and Ralph Newport wcnl over there after him. They managed to get him out. But I heard this kid yelling that another guy was downstream and I look off. I ran down the stream and all I could see was a head bobbing up and down. I tore off my shoes and dove into the water. All I could see was his hair. I grabbed him and dragged him lo the bank. It turned out to be Frankie Reiss. He was a heavy guy and when I got to the bank, I hollered to someone to help me. This guy, Nick from Jersey TV, Nick LaMagna, he's a volunteer fireman, and another guy from Hose Company Two , they gave me a hand dragging him up the bank. I started to give him mouth to mouth. He was all black. He wasn't breathing. I gave him three breaths and he started puffing and soon he started breathing. Then the Rescue Squad came and started giving him oxygen. They cut a hole in a fence (along the stream) so we could get him out. We got him through the fence. Teddy came down and we started going downstream on the assumption Johnny (Guerino) had gone down there We thought if we could find him right away there'd still be a chance. We revived Frankie so we thought we had a chance. So we proceeded. We put a rope across the (Kingsland) Pond We searched the island, all around the dam. We kept on going all the way down the stream to Data Processing. On the way back, we heard that someone was saying Johnnie was tapping under the bridge. When we got back to the bridge, they said they had skin divers coming up from Belleville and Essex County. We had just gotten there and saw they (the divers) had a rope but the current was so strong they couldn't get under the bridge. Well, I borrowed an air lank from one of the guys and I want under there. THE SUN: We thought someone from the County Park Police tried to stop you. Yes they did. But I told them I was an experienced diver so they let me go. Anyway, I couldn't go more than six feet because when I tried lo come up (under the bridge) all I found was debris clogged up between the girders. THE SUN: What did you have with you, an air tank? Mask? I went back and told him (the Mayor) that you're never going to get him this way — that they’d have to go in through the top. It was a miracle Johnnie could stay under there — a miracle that he just happened to come up and find something (a pipe) lo hold on to. When I was down there, the current was so strong my body was out straight. If the water was only four feet deep, you wouldn't have been able to stand up. I went back up on the bridge and finally (after one test boring) we got through a small hole. And when we talked to Johnnie, he was busting right from the start “Give me a raincoat,' he said. Then he wanted a cigarette (which was sent down) "Make that hole bigger. Get me the hell out of here," he yelled. THE SUN: Could he have made it out if he just took a deep breath and went under? Listen, I don't know but if I was that sure he could, I would have done that myself and gone under there. Remember those guys from Essex County were experienced divers and they couldn't even get under the bridge that’s why I went under. THE SUN: How experienced diver are you anyway? I really haven’t done it in years. I used to go in the Franklin Quarry. I think I went three or four times. THE SUN: How did you manage, then, lo get under the bridge when the experienced diving team could not? I was more involved. I'm closer to Johnnie Guerino. I wasn't in a strange town with strange people. I was hoping to go from one girder lo the next but I couldn't even come up. I was feeling under the roadbed with one hand and it was all I could do to hold on with the other. Let me tell you something and I’ll be honest with you, I got scared under there and when I couldn't find any spot to come up. I had to try and get out. THE SUN: When we saw you downstream about an hour before all this, most people seemed to have given him up. Well. I did. I gave up. I thought if we found him then, he’d be dead. It's something that makes you sick lo say, but hey, remember we got those first hand reports from those people on Passaic Avenue that they saw him go under the bridge. And then they found the shoe and his gun. But what an effort. A lot of civilians too — everyone got involved. They were helping us with the ropes. The only thing was on the bridge at the end. Too many people. Those TV guys nearly pushed people into the hole. And then Channel 5 tried to grab the Mayor and I give him a lot of credit too. He told them he had to go to the hospital — and they turned off their cameras. Reprinted for educational and historic purposes.